Millennium Tower is the grandest, newest luxury living experience in Downtown Boston. Wake up to some of the most amazing views of beautiful Boston from the 22nd floor with soaring high ceilings while enjoying the equally fabulous finishes throughout your new home. The unit itself features Poggenpohl kitchen and bath cabinetry,Sub-zero, Bosch, and Thermador appliances. Within the amenity rich building, residents have access to a full time concierge, state of the art fitness center, stunning club room with billiard parlor, private resident restaurant, screening room, a beautiful outdoor terrace, a pool, and more. Outside its doors are some of the trendiest and hottest restaurants, bars, and shopping experiences in Boston including a new Roche Bros. gourmet grocery store. 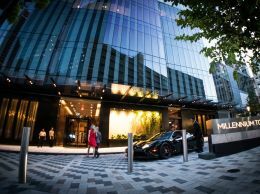 Millennium Tower is truly a unique experience that offers not only a place to call home, but also a premium lifestyle for all its residents.